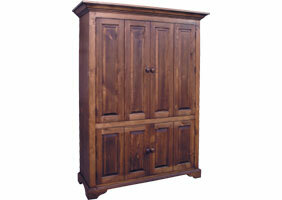 The Flat Screen TV Armoire has bifold doors and lower storage. 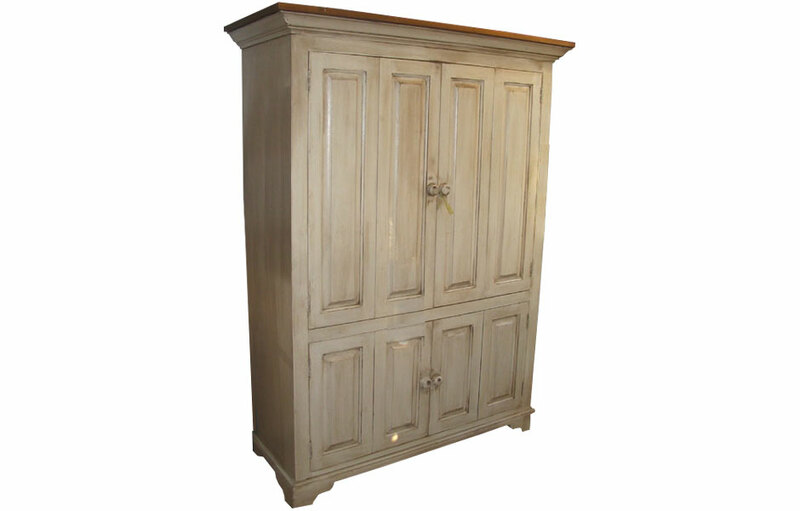 The upper armoire doors are bifold, they lay flat to the cabinet face for ease of viewing the TV. The upper TV cabinet accommodates up to a 52" flat screen TV, and has an upper shelf for storing media components. The lower cabinet has two doors that open to one shelf located in the center. There are holes drilled in the back for cords. 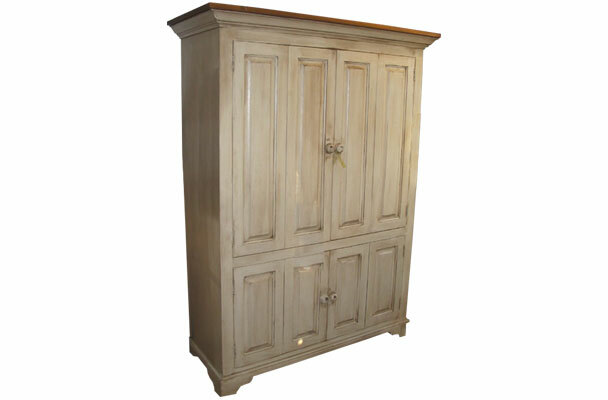 The Provence Flat Screen TV Armoire adds French-style and useful media cabinet storage to a living room. 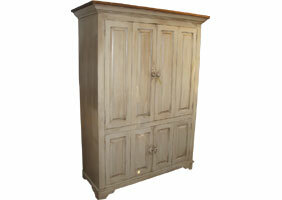 The media armoire will be utilized for everything from watching the big game to cozying up for a movie night. The TV Armoire has bifold doors which fold in half, and then fold back away from the viewing area of the TV. The doors allow for an unobstructed view of the TV when open, and provide elegant raised panel cabinetry when closed. Inside the upper cabinet is room for up to a 52" wide flat screen TV, and an upper shelf for a cable box, DVD, Roku or Apple TV. The lower cabinet has standard doors that open to one centered shelf for storing other media components and equipment. There are cord holes drilled in the back of the unit to pass cords between the upper and lower cabinet. 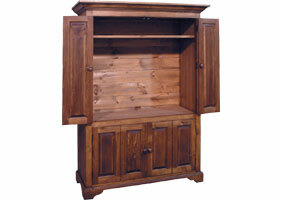 The flat screen media cabinet is made of solid wood including the tongue and groove "shiplap" backing. The interior shelves are solid wood. 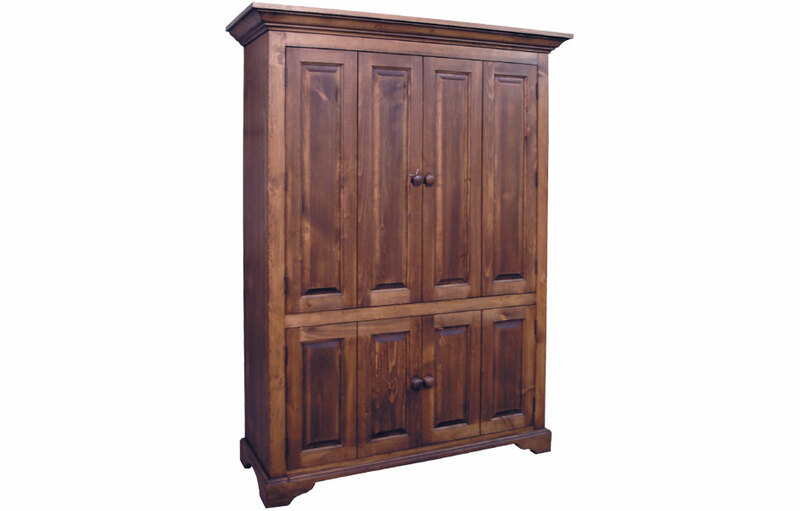 The elegant media armoire front has (8) raised panels on the doors, traditional wood knobs, and elevated contoured feet. Select a finish from any of our paint or stain options. The interior and the top crown are stained for a traditional French Country style unless otherwise indicated. Flat Screen TV Armoire, Millstone Glaze. Flat Screen TV Armoire, Walnut.